Undergraduate student loans offer those without much money the ability to secure a top-notch education. College is getting more expensive every year. To get a four-year degree, you will most likely incur a bill for many thousands of dollars. This causes many people who do not have the money to stay at home. If you do not get the education that you need, it will be harder and harder to make enough money to live in a comfortable lifestyle. Therefore, getting undergraduate student loans could be the key to your long-term success. Here are a few things to think about when dealing with student loans. While it might seem like a big investment now, it will make a very big difference down the road. Your earning potential when you go to college is double your earning potential if you are simply a high school graduate. According to recent estimates, the average college graduate earns approximately $2.1 million in their lifetime. The average high school graduate earns about $1.2 million in their lifetime. This is a huge difference over the course of your entire lifetime and can result in a vastly different standard of life. Paying a few thousand dollars for college will easily be repaid by the extra million dollars that you earn as a result of the loan. Student loans are typically about the lowest interest rate that you can find on any type of loan. You will often be able to find an interest rate that is very reasonable and allows you to pay off the loan without being charged a large amount of money over the life of the loan. Therefore, taking out a student loan for $40,000 will be a lot easier for you to pay off than a similar $40,000 loan for anything else. 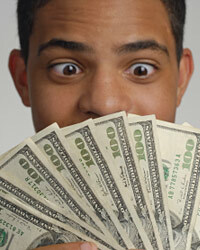 Another advantage that student loans have is the ability to deduct the interest you pay on your taxes. While the interest amount will not be that substantial, it will provide you with a little bit of savings. Any savings you can get on your taxes will help you out in the long run. Student loans offer a feature that few other loans can match. During your time in school, you do not pay a dime and interest does not start accumulating. As long as you are in school, you will not have to repay the loans. You could stay in school for 10 years if you want and nothing will be due. Then once you stop taking classes, you have a six month window before you have to start making payments on them. This gives you the ability to find a job before you have to make any payments. In addition to that, student loans give you the ability to defer payments because of financial hardship as well. Therefore, if you run into problems down the road, they will work with you to keep you out of default.